The good news about real estate prospecting letters is that they can be a cost-effective marketing tool for generating leads in and around your farming area. The potentially bad news about using prospecting letters is that the results they produce often fall short of expectations. There are a lot of reasons for real estate marketing letters performing poorly, but the thing to keep in mind is that many of those flaws are correctable. In other words, if you take a close look at the content and appearance of your real estate letters, there are frequently changes, edits, and improvements you can make that will enhance your response rate and help you produce better results. Here are a few often-overlooked tweaks you can make that can strengthen your marketing message and help you produce more responses from prospective clients in your farming area. As an example: Real estate agent introduction letters often begin by saying something like this: “Hello. My name is John Q. Farmer, and I’d like to take this opportunity to introduce myself and my real estate marketing services to you.” While that wording may occasionally work to generate a real estate lead or two, a more engaging way to get your prospects to read your letter is by either starting out with a thought-provoking question or a statistic that potential clients will relate to. A strategy that does not occur to many real estate agents — but that can be more effective — is to introduce yourself in the second paragraph, instead of in the first sentence. That way, you’ve used a strategy to catch their attention and get them thinking about things like the potential pitfalls of choosing the wrong real estate agent or attempting to sell their home on their own. The next logical step in your real estate prospecting letter (or introduction letter) would be to spell out the reasons you are the best choice for helping them achieve their real estate goals in the most efficient and effective way possible. Prospecting letter tips: Avoid the temptation to throw together and send out a boilerplate prospecting letter that looks cluttered, poorly organized, impersonal, and unedited. Taking the time to carefully proofread and review your marketing message can have a positive impact on your response rate. Another fatal flaw of many real estate farming letters is a failure to include a persuasive “call to action.” In addition to urging prospects to contact you for a free comparative market analysis of their home, you might also want to encourage them to visit your blog or subscribe online to your free real estate newsletter featuring articles on home staging strategies, household energy saving tips, the latest real estate market trends, home security tactics, and/or how to choose a real estate agent who will best serve their needs. Note: If you’d like to have access to a collection of professionally written real estate articles on topics like home selling, home buying, home staging, and real estate financing, then check out this real estate marketing kit. * It features 260 relevant articles you can use in your own blog, newsletter, or web site. The kit also includes 320 real estate prospecting templates and marketing letters you can easily customize and send out to your farming area or email subscriber list. One resource that can be of immediate benefit to you and your real estate marketing efforts is the free sample of an expired listing prospecting letter that is featured on the website. More details, here. Thanks for letting me share my latest thoughts on marketing strategies, real estate prospecting letters, email marketing, and direct mail techniques. Stay tuned for more real estate marketing ideas! Feel free to email me if you have any questions, comments, or inquiries. One formula for writing an effective real estate prospecting letter is to begin the message with an intriguing statistic, engaging question, or a statement that makes people sit up and take notice. The type of psychological response you want to elicit is something along the lines of “I didn’t know that!” or “Yes, that IS a concern of mine!” or “I can relate to what you’re saying!” or “Yes, that describes our situation perfectly!” From a sales standpoint, it’s beneficial to create a feeling of connection, agreement, or engagement as soon as possible in your message — whether it’s in an introductory letter, a real estate farming letter, or a expired listing prospecting letter. One strategy for increasing interest in your real estate marketing letter is to enclose a brief real estate newsletter and print a short blurb about it on the outside of the envelop to arouse curiosity or trigger interest. In addition to including the usual “call to action” in your real estate prospecting letter, such as “Contact me for a free comparative market analysis,” or “Call me if you’re thinking about putting your home on the market,” a good way to create more engagement and top-of-mind awareness is to encourage them to check out your latest blog post on a topic of interest to homeowners, such as home security tips, how to save money on energy costs, or “ten tips for selling your home faster”. Make your real estate prospecting letter as visually appealing as possible by breaking it up into several paragraphs and including as much “white space” as you can. Including several “bullet points,” like the ones in this list you’re reading, will also help pull in the attention of your prospects and enable them to digest your message more easily. If your letter looks too cluttered and long, then many people won’t have the patience or time to sift through all those words! 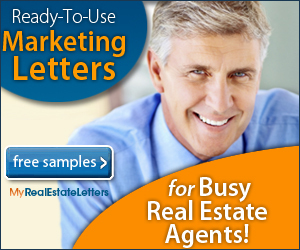 I invite you to visit this real estate marketing blog again for more tips, strategies, and techniques for creating effective real estate prospecting letters, farming letters, and agent introduction letters. I’ll also include helpful sales and marketing tips, email marketing ideas, and strategies for creating an effective integrated marketing campaign in your real estate farming area. Contact me if you have any questions and/or need engaging blog posts written for your real estate website, newsletter, or blog. I’d be happy to provide you with links to samples of my writing that are now appearing on dozens of real estate agent websites. *Disclaimer: I am a compensated affiliate of a number of digital products, professional development courses, and real estate marketing tools referenced in this blog, including real estate flyers templates, prospecting letters, templates for real estate agent introduction letters, short sale prospecting letters, FSBO prospecting letters, real estate open house letters, neighborhood listing announcement, new agent announcement, and real estate thank you letters. How engaging is the letter? The extent to which you’ve caught and held your prospects attention — starting from the first sentence of the letter — is crucial. Call to action: The inclusion of more than one “call to action” (telling your prospects what to do when they finish reading your letter) can help boost your response rate. First Impressions: Is your real estate prospecting letter visually inviting… or cluttered-looking and verbose? The answer to that question will impact the response rate to your marketing letter. Incentives and Curiosity Factor: Have you immediately aroused curiosity, grabbed attention, or given your prospects any incentive to open the envelope or click on the subject-line of your marketing email? If not, many of your prospecting letters will not see the light of day! Realize that sending out prospecting letters is an ongoing process, in which success can be defined in more than one way. Obviously, the intention of any real estate marketing strategy is to acquire more clients and generate additional income. However, if your real estate prospecting letter results in more visits to your blog, subscriptions to your email newsletter, or enhanced name recognition in your farming area, then your mailing campaign has achieved a degree of success. Of course, if the marketing letter produces phone calls, email inquiries, referrals, or additional visits to your next open house, then all the better! Real estate prospecting letter templates are a good starting point for crafting a well-written marketing message to prospective clients in your farming area. If you’re looking for an extensive collection of professional real estate marketing letters for virtually any purpose — including relationship building — then visit this site*. Whether or not you decide to download the complete kit of 320 real estate marketing letters, the website features a free sample of an expired listing prospecting letter, which can provide both guidance, usable content, and structure to your letter-writing efforts. To view the sample marketing letter template*, click on the yellow “sample letters” button” on the website. Real estate marketing letters can serve many purposes beyond just staying in touch with prospects in your farming area. As an example, you can tailor your marketing letters to generate leads and forge relationships with specific segments of your target groups, such as FSBO prospects, expired listing prospects, and first-time home buyers. Your priorities: Your prospecting letter needs to emphasize the fact that your top priorities include providing exceptional service, making yourself available on an as-needed basis, and producing the best possible results for your clients. Nothing succeeds like success: If you’ve recently sold properties in your farming area, it can help lower sales resistance and boost your marketability to mention your recent successes — especially if you sold houses at or above the asking price. Demonstrating the ability to sell homes quickly also carries a lot of weight in the minds of potential real estate clients. As a side note, there are a variety of ways to establish yourself as an authority on the subject of real estate marketing and the local real estate market, including blogging, distributing a monthly real estate newsletter (via email or postal mail), and being featured, quoted, or mentioned in media interviews, news stories, or popular local blogs. There are several different kinds of real estate marketing letters — including Realtor introduction letters, real estate thank you letters, and real estate farming letters — and they are all important elements of a well executed real estate marketing plan. Credibility: Distributing marketing letters, helpful homeowner and home seller tips, and real estate newsletters to your farming area (and your email subscriber list) can help establish you as a source of timely information, relevant insights, and important updates about the local real estate market, as well as the process of selling and buying homes. Establishing and reinforcing an image of professionalism: Real estate marketing letters and news letter sent out on a regular basis can help cultivate a reputation for you as a proactive, resourceful, and dedicated real estate professional. When it comes to making real estate marketing letters an active part of your marketing strategy, success is often determined by your ability to catch people’s attention, present your message in clear and persuasive way, and motivate them to take action. Question: Can real estate prospecting letters be used to produce sales leads, increase name recognition in an agent’s real estate farming area, and generate inquiries from prospective clients? Answer: The short answer is “yes!” Here’s the longer answer: Real estate prospecting letters can and do accomplish all those things if they’re well written, targeted, and sent out as part of an integrated marketing plan. What that essentially means is that building “top of mind awareness” is an ongoing process in which one real estate marketing strategy reinforces another. As an example, if you mail out one real estate marketing postcard to your farming area announcing a “just sold” or “just listed” property in the neighborhood, it may get noticed by a handful of people and produce a few phone calls. More importantly, though, you’ve begun the process of familiarizing people in your farming area with your name, your photo, and your proactive approach to marketing real estate listings. Side note: Sending out real estate introduction letters, marketing postcards, or farming letters could be compared to planting seeds — which is probably why they’re called “farming letters”. Those individual contacts need to be nurtured, though, so they can grow into profitable client relationships. Then, a month later, you sent out a real estate marketing newsletter updating your farming area on the latest news, trends, and relevant statistics in the real estate market. UPDATE: In my geographic area, for example, a local association of Realtors announced today that pending sales of new and existing single-family houses were 14 percent higher last month, than they were last year during the same period. This, coupled with a 16% decrease in local inventory, has created a “sellers’ market,” according to the association’s CEO. It’s exactly this type of timely real estate news that would be of interest to homeowners in your farming area — especially the ones thinking about putting their house on the market in the near future. By sending out periodic real estate news letters — using postal mail and/or email — you’ll be positioning yourself as a source of credible and up-to-date information about the local real estate market. You can reinforce that image and expand your visibility by creating a real estate blog and posting articles to it at least once a week. You can either create a blog on your own website (contact your web hosting service if you have any questions about doing this) or you can publish blog posts through your Linkedin account and have it shared with everyone in your network. It’s also a good idea to share your real estate blog posts with your followers on Facebook, Twitter, Google Plus, and other social networks you post on. So whether you’re mailing out real estate prospecting letters, publishing weekly blog posts, sending out real estate marketing newsletters to your farming area, or creating top-of-mind awareness through a real estate postcard marketing campaign, a combined approach to real estate farming is one of the most effective ways to get noticed and stand out from the crowd. Visit my website for helpful tips on postcard marketing, social media marketing for real estate agents, business-building articles and real estate marketing strategies. Although the cliche “Time is money” is a hackneyed one, there is more than a grain of truth in that saying. Productivity and success in the real estate business are the direct result of careful time management, a positive mindset, and a commitment to continually honing your skills and knowledge. Having immediate access to a collection of professionally written real estate prospecting letters* doesn’t hurt, either! The ideal scenario in real estate sales is to have one or more marketing campaigns in place that cause qualified prospects to contact you, rather than vice versa. Imagine a steady stream of home owners and house hunters inquiring about your services, every day, in response to real estate postcard mailings, prospecting letters sent to your farming area, real estate listings on your web site, your monthly real estate email newsletter, referrals, a series of engaging blog posts you wrote and promoted, and other real estate marketing strategies. By targeting your audience as much as possible and tailoring the prospecting letter message to the needs and wants of specific demographics, you’ll be increasing the likelihood of generating more qualified leads. Real estate marketing tip: Experiment with different subject lines for your email promotions to increase your percentage of emails that are actually opened and read. The same thing applies to the “open rate” of your direct mail campaigns and farming letter mailing, which can often be improved by printing, rubber stamping, or even writing blurbs (“teasers”) on the outside of your envelopes. By the way. . . When you use email marketing services, such as Mail Chimp, Constant Contact, AWeber, GetResponse, and Fluttermail, it’s usually possible to insert the recipient’s name in the subject line, a tactic that frequently results in a higher open rate. There is a variety of real estate marketing templates, prospecting letter kits, email marketing software, real estate flyer template kits, and real estate postcard marketing ebooks you can download to help you improve your lead generation results, save time, and present a more professional image to your prospective clients. Depending on who you talk to, real estate farming letters are either a guaranteed way to generate leads or a complete waste of time and money. In reality, the truth lies somewhere between those two statements, and your degree of success depends largely on factors within your control. One of the cornerstones of a successful real estate marketing strategy is the realization that client acquisition, effective networking, relationship development, and building name recognition in your farming area is a process, rather than the result of a few sporadic direct mail campaigns. Well-written real estate farming letters CAN produce a flurry of phone calls, email inquiries, and qualified leads, but, as the old expression goes: It’s better not to put all your eggs in one basket! Go into it with a positive attitude! Whether you’re sending out real estate prospecting letters, press releases, a postcard mailing , open house flyers, real estate referral letters, newsletters, or an update to your email subscribers, it’s beneficial to infuse your message with a feeling of optimism, enthusiasm, and confidence in your abilities. The slightest hint of negativity, self doubt, or pessimism can easily seep into your marketing message and weaken its impact. Consider using real estate templates* to save time, reduce frustration, and target your audience more effectively. Real estate letter templates can increase your productivity, improve time management, and help you avoid trying to “reinvent the wheel.” You’ll feel much more in control of your time and resources when you do not have to start from scratch when you compose FSBO prospecting letters, short sale prospecting letters, referral requests, thank you notes, new agent introduction letters, real estate farming letters, and expired listing prospecting letters. Speaking of expired listing prospecting letters, you can get a free sample of a professionally written one at a site I’m affiliated with called My Real Estate Letters. * In addition to featuring real estate marketing ideas for both new and seasoned real estate agents, the website also offers a marketing kit* of real estate prospecting letters, ready to use content for your newsletter, templates of real estate thank you letters, and dozens of different strategies for marketing your services to potential real estate clients in your farming area. Another marketing tool worth mentioning is real estate listing flyers. If you’re looking for real estate flyer templates, there’s a kit of 53 templates you can download at Turkey Flyers*. Samples of professionally designed real estate open house flyers are featured on the website. Remember the basics: Whether you’re writing a real estate farming letter, a referral request letter, or a professional networking letter, make sure to thoroughly proofread and edit your message two or three times to make sure you’ve caught all typos, awkward sentences, inaccuracies, hints of negativity, or opportunities to promote yourself. For example, if you’re holding an open house next weekend or planning to attend a local community event, invite people to stop by and introduce themselves or join you for a cup of coffee. Effective real estate farming letters also include as much contact information as possible and a few “calls for action,” encouraging your prospects to respond in some way, such as calling or emailing you, visiting your website, checking out your latest blog post, scheduling an appointment, requesting a free comparative market analysis, or whatever it is that you want them to do. One final tip I want to mention for today is the importance of using “white space,” paragraphs, bullet points, and other design elements to help make your real estate marketing letters look more visually appealing. If the page looks too cluttered or verbose, it could make your prospecting letter a strong candidate for the recycling bin! Thanks for checking out my latest thoughts on real estate marketing, letter writing, and crafting an effective advertising message. Stay tuned for more tips and strategies on topics like lead generation and the ingredients of a real estate agent marketing plan. *Disclaimer: My blog posts feature links to real estate marketing tools, templates, and websites for which I am a compensated affiliate. One of the secrets of success in any aspect of sales, business, or human relations is establishing rapport. When you make a connection with another person, whether it’s through a shared experience, a mutual interest, or a similar background, layers of sales resistance, distrust, and skepticism melt away. Beginning a real estate prospecting letters with some sort of “ice breaker” can be more effective than immediately talking about yourself and the fact that you’re available to meet your prospects’ real estate sales needs. In the same way that you probably wouldn’t instantly go into a sales pitch in the first few minutes of a face-to-face meeting, real estate marketing letters tend to be more engaging when there’s a sentence or two that warms them up, catches their attention, and eases them into the letter. There are countless ways you can approach the introductory paragraph to a real estate prospecting letter, but here are a few ideas that will help get your creative juices flowing. Keep in mind, that a real estate prospecting letter should always reflect your personality, express a genuine desire to serve your clients’ needs, and emphasize your commitment to producing the best possible results within the shortest period of time. Here’s an example of some introductory text you could use in the opening lines of a well crafted real estate prospecting letter or email marketing letter. It establishes a need for your services and positions you as a qualified and dedicated real estate advisor. While it’s important to use your own “voice” in writing real estate introduction letters and prospecting letters, you’re welcome to adapt and use the following text in your next real estate marketing letter. Prospective home sellers interested in learning about things like home staging, security tips for home sellers, and pricing options. Brainstorming about ways in which to use real estate prospecting letters can generate a lot of good ideas, as well as strategies for requesting referrals and potential target groups you might have overlooked. Here are a few additional ideas for lead generation, relationship building, and networking. Acknowledging clients and prospects on an individual basis to congratulate them on a new job, promotion, a new birth, engagement, birthday, anniversary, or other milestones. Keeping track of all these occasions requires you to be ultra-organized and alert, but it can be productive because people love to be acknowledged and recognized for their accomplishments, special occasions, and even losses. Compiling and distributing a quarterly newsletter (or having an assistant or freelancer handle it for you) can be a good way to stay in touch, cultivate “top of mind awareness” in your farming area, and build a reputation as a credible source of information about home ownership, the local real estate market, and the business side of real estate transactions. The inspiration for this blog post was a website called My Marketing Letters*, which is filled with marketing ideas and features examples of real estate prospecting letters and an assortment of ideas for building professional relationships, generating real estate referrals, and staying in touch with potential clients in your real estate farming area. Thanks for checking out my latest blog post on real estate marketing ideas, prospecting letters for real estate agents, and strategies for generating leads, inquiries, and real estate referrals. Stay tuned for more prospecting ideas and marketing tactics. Disclaimer: Many of my blog posts feature links to templates, digital products, and websites for which I am a compensated affiliate.